The appearance of the Serbian capital of Belgrade, largely due to the fact that the city is located on the border between the Balkans and Central Europe. Here, a special flavor, which is due to close proximity of green parks with half-empty ultramodern skyscrapers made of metal, glass and concrete. The architectural appearance of the capital has changed since its foundation by the Celts in the III. n. e., on the whole it is completely destroyed, then rebuilt 40 times. In spite of all the vicissitudes of fate, today Belgrade – is the largest city in Europe, 4th in the Balkans after Bucharest, Istanbul, Athens. 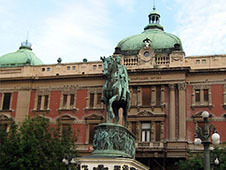 The capital of modern Serbia – a single territorial unit, where there are 17 municipalities, parliament, the city government. Belgrade is considered the heart of the economy, a beacon of science, industry, education and trade. There are unique architectural monuments, cathedrals, churches, fortresses. It is also the capital of the famous neighborhoods, where you can admire beautiful landscapes, lush medieval monastery. Travel the country in the most comfortable car rented at the airport, the center of Belgrade. Book a car online can advance by visiting bookingcar.ru. For smooth movement of the roads of Belgrade provided payment, the amount of which depends on the category of car. Machines with 2 axles, up to 1.3 m near the first axis; 2-axis cars up to 1.9 m to 3.5 m.
Vehicles up to 1.3 m with 2 axles, and in the area of ​​the 1st axis of the trailer is provided; 2-axis machines up to 1.9 m, weighing up to 3.5 tons with a trailer; 2-axle cars up to 1.9 m tall, weighing up to 3.5 tonnes. 2,3-axis machines up to 1.3 m in height in the area of ​​the 1st axis, weighing up to 3.5 tonnes; cars with 2 axles up to 1.9 m tall, weighing up to 3.5 tons with a trailer. Directions can be in euros, RSD, while accepted only Serb paper bills, some stations may accept payment in coins €. On the territory of Serbia, the rules according to which in the period from 01.11 at 01.04 the vehicle must be equipped with winter tires, the tread depth which should be at least 4 mm. The motorist must have a reflective vest in the car, a set of spare bulbs for headlights, reflective vest, tow rope, spare tire. Also it is necessary to carry a first aid kit, a fire extinguisher, warning triangle 1, if there is a trailer - 2 characters. Motorist is forbidden to move on cars with tinted windscreen, the capacity of the front side windows must be at least 70%. It can be tinted windows rear view, provided that the vehicle is equipped with a pair of rear-view mirrors. Violation is punishable by a fine of 5,000 RSD. While driving a car driver, passengers must wear seat belts. When moving along the roads of the country should abandon the conversation on a mobile phone, if there is no special headset. For violation of the rules could face a fine of 6,000 RSD. Motorists traveling on Serbia should be remembered that if the level of alcohol in the blood exceeds 0,3 ‰, it will end a fine, deprivation of rights. Depending on the degree of intoxication would have to pay from 6,000 RSD to 120,000 RSD, while it is impossible to drive the car for 3-8 months. Particularly serious violations are punishable by imprisonment for a period of 15 days.